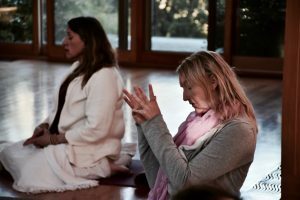 Question: Spontaneous yogic movements, called kriyas, are a phenomena observed in participants of all of your retreats as a result of the stirring, awakening and rising of Kundalini Shakti. This is certainly something quite unique and rare. What exactly is Kundalini? What is necessary to activate this energy, and what is the place of kriyas in the process of awakening? The term “Kundalini,” though very well-known now among practitioners of yoga in the West, is said to represent the soul in terms of its life force, as it animates all processes in the body. So in other words, seen from that slightly reductionistic point of view — and we will expound on other points of view in a moment — Kundalini is the power that is in charge and control of absolutely all functioning, in what we understand as this psychophysiological-organism, in what we understand to be this human being. We can go on translating the term Kundalini, or pairing this term with many other terms from various perspectives, in order to have a departure from this uniquely Hindu perspective, or from the perspective which is mainly associated with Vedic, tantric, or yogic culture. And even if we don’t find the term Kundalini mentioned in such traditions as Buddhism, Jainism, or other traditions born in the Indian subcontinent, it does not mean they do not operate with this concept. So it is very important that we have a clear understanding of what Kundalini is, as opposed to the quite prevalent notion which somehow became commonplace as it has been transported from Indian culture, and then adopted in Western spiritual circles. In other words, Kundalini is not just some esoteric force that is present at the base of our physiology — of our mental faculties and all our reflective and automated responses — but it is who we are, in essence. Therefore, in my own way, whenever I try to dispel the air of mysticism, and deconstruct terms that exist, and the perspective that Kundalini has gained in modern language, I often just say Kundalini is just that — soul. It is your soul. It is your soul and my soul. However, when we say that, it poses certain dilemmas, because the perspective of the soul — if that term is understood from the Judeo-Christian perspective, then everyone is embedded with a soul and everyone is just that — soul. Every human being is a living, breathing soul. But when we speak from the Hindu perspective, though everyone has Kundalini at the base of their individuality, it is, as it were, dormant. So, to reconcile these two different perspectives, I would like to mention certain aspects of how to understand the soul in relation to Kundalini, and what is dormant here — what needs to be activated. And this will allow us to enter a greater understanding of what this force is. From the Hindu perspective — again many practitioners of yoga know this very well — Kundalini is that life force which is coiled at the base of the spine in the Muladhara Chakra, which represents the potential present in human Consciousness in a dormant state, in a state of homeostasis. And that dormant energy needs to be awakened in order for necessary transformative processes to ensue. In other words, from the Hindu perspective, no practices bear any fruit unless the very force responsible for the transformation of Consciousness is being released. How does this sit in relation to the concept of the soul? We can introduce a metaphor, that our soul is also in a state of potentiality or dormancy, and that in order for the soul to actualize itself, it needs to undergo the process of actualization. So we can actually attempt to create a parallel to the term “awakening,” with the term “actualization.” And if we do that, we will arrive quite naturally at a new understanding, that in order to truly fully enjoy who we are, we need to actualize the potential of our soul. This is the loftiest aspiration behind all spiritual practices, regardless of where they were born, and where they were developed. With this introduction, we can begin answering the question of what Kundalini is. And to simplify it, Kundalini is our soul in its pure potentiality. In other words, it is the very potentiality present within every being — the potentiality of who we are — as opposed to what we perceive ourselves to be. The latter is important, because who we perceive ourselves to be is in fact an error of the language, because we don’t perceive ourselves to be anything other than a set of ideas and ideations. Our perception of who we are is just that — a set of memories about what this or that concept has formed and instructed us along the way, from the moment when we began to cognize our environment and surroundings, and as toddlers, began to make sense out of all that. And with the progressive growth of the human organism, this set of ideas eventually crystallizes into what we then understand to be our individuality. And when we speak of Kundalini, it is precisely what happens when that force is released from its contracted state of identification with this psychophysiological-organism. Because the very notion of ourselves is a byproduct of progressive information of who we think ourselves to be — this is what puts our consciousness into that state of homeostasis in the first place. In other words, it’s like we are undergoing a certain necessary programming… we are being programmed in order to grow and function as this evolved human, in order to be part of this culture we are born into. And awakening is what deprograms us from that programming that took place. This may be a simplified perspective, but it is a helpful one if we are to introduce ourselves to what Kundalini is, without getting drowned in its very rich esoteric language. Now, as soon as we have attempted to answer this question, I’d like to add immediately that it’s practically impossible to fully articulate what Kundalini is. Why? Because as we’ve said that Kundalini is our soul, another very suitable term for Kundalini is Consciousness. In other words, Kundalini is our Consciousness — our soul, our Consciousness — just different terms for the same thing, the same reality. So why is it impossible to have a clear understanding of what Kundalini is? Because that would be to reduce Consciousness to an object. We can never understand Kundalini, because Kundalini is not an object — it’s our Consciousness. Consciousness is that which illumines the objects of our perception. But there is no other agency that illumines Consciousness. Yes, there are talks in modern spirituality that split hairs when it comes to the terms “Awareness” and “Consciousness,” that say, “Oh, wait a minute, Consciousness is not final — Consciousness is an extremely fine reality, but there is something finer still, and that is Awareness.” We can agree with that, however, the term “Consciousness” has been used even by some perennial figures of the past, with the absolute same punctuation as the term “Awareness” — namely the figures within the Indian tradition, Sri Aurobindo and Maharishi Mahesh Yogi. Whenever they spoke about Consciousness, they spoke of it in terms of Ultimate Reality. We can introduce here another term which is quite well known among the practitioners of yoga, the term “chit.” Chit. Chit is that — Consciousness. And it is essentially that which knows everything. It is the knower of reality, and it cannot be reduced to an object by virtue of which one can know chit. Because chit is that which knows. And Kundalini is chit in the life force of a human body. Question: What is necessary to activate the energy? Again, responding to this risks having a reductionist understanding, if we speak of Kundalini as just some kind of energy residing in the body. As soon as we begin to think of Kundalini as some kind of energy — however profound, however marvelous and magnificent, yet it’s just some kind of energy residing in the body — we are running the risk of reducing our own Consciousness to an object of observation. And this is why I would like to respond to this question from a different perspective than it is commonly understood or commonly responded to in many books or articles that are out there in today’s world of spirituality. When we come to this understanding that this energy is nothing other than our own Awareness — our own Awareness in a state of identification with the body-mind conglomerate — then we understand that in order for that energy to awaken, something has to happen within Consciousness Itself. In order for awakening to truly take place, there has to be some movement which is inherent in the very quality of that Consciousness, which is — again speaking from that spoken language — is contracted to its own glory. Many traditions have come up with some elaborate practices and techniques for how to activate this energy. Hatha Yoga comes to mind as one of the more well known ones, where that is achieved through forcible control of the life force itself. The whole system of Hatha Yoga can essentially be narrowed down to techniques for controlling life force via control of the breath. Yes, Hatha Yoga contains all different practices, but the core of Hatha Yoga practices is to be able to control the life force through breathing exercises. Everyone who has been initiated into the subtleties of pranayama knows that pranayama is the royal highway when it comes to Hatha Yoga practices. Hatha yoga is not the only system. There are many different yogas, if we speak of the Indian tradition. There are practices that aim at intense concentration on certain aspects within the mental modalities. In other words, there are different techniques and very different methodologies implemented in something parallel to what has just been mentioned — in comparison to Hatha Yoga — known in Indian culture as Jnana Yoga. These practices emphasize the practice of self-inquiry, analytical insight into the nature of experience itself — the introspective practices which aim at creating a possibility, where through using the mental capacities the life force is essentially being agitated. In parallel, just as in Hatha Yoga, the breath is the main thread, in Jnana Yoga it is the mind. There are other techniques still, other methodologies to create very subtle and very powerful vibrations on the level of the emotional body, with the force of one’s own feeling. It’s what is known more as the path of emotion or feeling — devotional yoga. It’s the yoga of devotion — Bhakti Yoga. We can go on giving different examples of using certain main faculties present in human beings, but we could say that there are practices that utilize the combined effect of those mentioned above. And all these practices utilize meditation, because meditation — irrespective of one’s approach, be it Hatha Yoga or Jnana Yoga or Bhakti Yoga — is where that power is really being harnessed. And when it comes to the spontaneous occurrence of these movements, known as kriyas — irrespective of what methodology is being used — when awakening is taking place, the life force is released, and when the life force is released, the whole structure goes through phases known in the greater yogic tradition as “trembling.” And that is because when the life force is being released from its seat, it begins to — as it were — send profound waves of energy throughout the entire subtle body. As we know now, many practitioners of yoga today know the subtle body is what constitutes this whole structure of chakras and subtle pathways of energy. So these waves of energy begin to resonate through the entire subtle body, and as they begin to resonate through the entire subtle body, the psychic centers are being affected. The psychic centers begin to tremble. This trembling of psychic centers occurs because the psychic centers are the seat of information; each psychic center, each chakra, contains a certain information necessary for survival, procreation, expression of will, feeling, communication and greater understanding of our place in this world. Altogether, that comprises the tree of life which lights the being within. And then of course it’s being taken for granted — and then we call it a human world, but yoga understood this as a science — yoga made it into a science. So whenever the chakra experiences the greater resonance, it begins to release information stored in it. 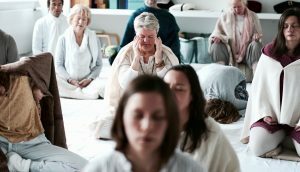 That is why before even a full ascent of Kundalini Shakti takes place, many of those who have been going through the process — known as release of deeper-seated psychic tendencies — know this can be accompanied by very pleasant… or in contrast to that, very unpleasant experiences on the physical, emotional, or mental levels. So these spontaneous movements of the body that we observe, what we call kriyas, are essentially that — a result of the entire subtle body undergoing the process of purification, release, exemplified by the release of deep-seated stresses, through the release of deep-seated information, and each time it is accompanied by some jolts — some movements. Therefore, kriyas are known for being physical, mental, emotional, and psychological. The body can shake and tremble, sway and jump and hop and contort. The body can perform various forms of known and unknown yoga asanas. The body can perform known or unknown mudras — gestures. The body can be engaged in various locks, known as bandhas. There can be spontaneous vocalization, “speaking in tongues” known as glossolalia. Or the body can be completely immovable, as a sphinx. All these belong to the myriad of kriyas. And kriyas here are not something that we do, but something that simply happens to us, when the life force begins to release from its seat. So to summarize, kriyas are signposts of progressive freeing of the system from all that information-field which contracts our awareness to what we are — to who we are. It’s just that! In the process of releasing, kriyas are simply this very spontaneous manifestation of that freeing of the system from that self-imposed superimposition. When we speak of the release of information as a result of awakening and progressive expansion of Consciousness — what is also known as the ascent of Consciousness, the ascent of Kundalini Shakti — it would be good perhaps to distinguish kriyas which are purificatory in nature. These are the kriyas which are brought about by the release of unprocessed information from any given psychic center. This unprocessed information is simply that — what we call in English language “stress.” Stress is something that puts our system under the pressure of processing, and our system failed to process it, and that has resulted in a stress. Unfortunately, unprocessed information doesn’t go anywhere; it lays as a sediment in our nervous system. And that’s what creates these blockages in an otherwise perfectly wired — in principle — human nervous system, designed to experience this wonder of being at once human and divine. And the very process of expansion of Consciousness is that — is to free the nervous system from these knots and nodules that are clogging the system with unprocessed information. In other types of kriyas, spontaneous movements also occur when a tremendous amount of energy is going through the neurophysiology. It is also very well known that even great sages of the past — for example, beings as Ramana Maharshi and Anandamayi Ma — despite being examples of highly advanced beings from an early age, they have exhibited what could be summarized as kriyas throughout their lives. In other words, it would be inconsistent to speak of release of stresses when it comes to beings who essentially have been spoken of and considered as saints in a given culture. Yet, their bodies were dealing with tremendous amounts of energy, which will result in certain movements, certain spontaneously taken attitudes — here what we mean by attitudes is spontaneously taking mudras, certain positions the body takes — only because the human nervous system was undergoing a process of tremendous flow of that energy, which is making that body move in unexpected, spontaneous ways. As a footnote, Ramana, as an example, he rarely exhibited this in public, almost as if he wanted to maintain composure. But his body would always take a certain shape, or form, but in private, in his quarters, he was known for shaking and trembling. Once when he was asked why he moved like that, he said, “Elephant makes the hut shake.” “Elephant” was the metaphor that Ramana used for awakened Kundalini. This is just to disperse this notion that kriyas are only for the purification process… Another example, the Yoga Vashishta, speaks of beings who tremble when they reach higher states of Consciousness; their bodies tremble, but in this case their bodies are trembling with bliss. Question: If kriyas are an essential aspect of awakening, why do we hear so little about them in other spiritual paths such as Buddhism, the Sufi path, Christianity, and even most yogic paths? Well, it’s not that the kriyas are essential in the sense of a prerequisite. Perhaps this is why we don’t hear certain aforementioned traditions addressing kriyas, because it’s not that kriyas constitute a certain deliberately invoked part of the methodology — it’s rather a byproduct. So why speak of the byproduct which simply happens, and which is simply part of the parcel? The essence is on the essence of the teaching, in any given tradition one way or the other. When we speak of Buddhism, the emphasis is on whatever that particular interpretation of Buddhism is, because we know there are many. When we speak of the Sufi path, it depends on what Sufi order we speak about, because there are many. Likewise with Christianity. And yoga is no exception. There are many different yogic paths. So it’s not that because kriyas are not specifically mentioned that kriyas are somehow irrelevant to the process, but perhaps because it is the very sign of internal manifestation of something which is inseparable from the journey, inseparable from the process of transformation. But the scriptures do not emphasize the byproducts. The scriptures usually emphasize the main tenets of this or that teaching. It’s not that I choose kriyas — they’re spontaneous movements. That’s why they’re called spontaneous! I receive letters and questions from people who are given to certain spiritual doctrines, which perhaps don’t even mention kriyas, and at times, in some cases, dismiss the validity of kriyas. And these people who follow these paths follow these doctrines, and follow these methodologies, often posing the question, “How come — I am giving myself to the process of self-inquiry, and now I am experiencing these kriyas?” There is no problem whatsoever, because Consciousness decides what is appropriate for the process. It doesn’t come from our mental set-up. It doesn’t belong to our likes or dislikes. All this belongs to that which we have spoken about as ideas and ideations we have about ourselves or the world. And kriyas overrun all that, and that’s the magic of this process! We may prefer to have the clean and crisp path of a Zen Buddhist, only to begin to experience all these movements of a whirling dervish. So what do we do then? Another reason for why we don’t hear so much about this — and I would like to take this as a chance to mention — is that when we speak of any given tradition we have to be very careful, and we have to have the courage to distinguish between tradition per se — which perhaps calcified to itself and is totally barren to the very aliveness — and what makes this tradition alive and throbbing with the teaching. And it is only those examples within the tradition where these processes are alive, that make the tradition alive. If tradition is only a set of certain beliefs, understandings — no matter how profound the conceptual expositions — if there is not a real visceral process, and I’m sorry to say that, these traditions simply die to themselves. And these traditions will undermine, overlook, and essentially devalue what is a manifestation of the very aliveness of that process. So this is also why we don’t hear it so much in certain traditions mentioned here, because the custodians of these traditions — not all of them are awakened beings. Not all of them have gone through these processes. Many of them are just that — no different from a mere scholar. I don’t know if this is too much, but I thought to throw it in… Just as awakening is a spontaneous process, so the kriyas that accompany that process are spontaneous. What may be worth mentioning here, is that a lack of understanding of this in those traditions where it is not enriched by continuous examples of real awakenings, creates situations where this is being suppressed, where these processes are simply being suppressed, where they’re being looked down upon, they’re being marginalized, and at times seen as anachronistic, unnecessary. Whereas, the fact is that the very wealth of every tradition — certainly when it comes to yoga — rests upon the liveliness of this process, experienced by its adepts. It is the adepts who enrich and keep the tradition alive — nothing else. No passing on sacred hymns in precise meter. No recitations. No elaborately performed rituals or sacrificial offerings are of any value, if these processes are not experienced firsthand internally in the adepts — who are adepts because they were made by this processes. All the lexicon of yoga only makes sense, because in the first place it came through these spontaneously unfolding yogic processes that were later put into sacred lore, as the very scriptures of any given sacred lore. What we are touching upon here, is that uncomfortable territory which has always existed between the territory of talking about it and actually being it… talking about it and being in the midst of this process, conceptualizing, understanding, writing and reading about it, and actually going through these processes — being made by these processes. – Igor Kufayev – an excerpt from the interview on Kundalini, Kriyas & the Path of the Heart, Mallorca, November 2016. A concise version has been published under the title “Spontaneous Yoga – Touched by Grace” by Igor Kufayev, ‘Yoga Aktuell’ Germany, February/March edition 2017. Images reproduced in this article – depicting involuntary movements arising during meditation sessions – were spontaneously captured at various events with Igor Kufayev. Photography Courtesy of Flowing Wakefulness Fellowship.